6800 Coach: Originally the GN Red River #1147 (name train that ran between St. Paul MN and Grand Forks North Dakota) diner-observation seating: lounge = 20, diner = 21, built by American Car and Foundry in 1950 and delivered May 13th. See GN Railway Historical Society reference sheet #231 for more information and pictures. 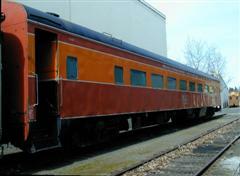 Converted into a coach in 1963, seats 68 (seats are reversible, tiled flooring). Sold to Amtrak (6800) in 1974 who then sold it to a private party in 1978 who then sold car to Great Western Tours in 1980. Purchased by the Chapter from GWT (GWT 568) who operated out of Yreka CA in April 1986. Has a leaky electrical locker and some rust problems. Painted in the SP Daylight paint scheme. Suitable for shortline operations. One operational bathroom, other bathroom needs a holding tank. Body is of lightweight carbon steel construction, cast pedestal trucks equipped with single equalizers and coil suspension, roller bearings. A purchased diesel fuel tank needs to be installed. Brake valves reconditioned 9/2001, electric heat and 110 volt outlet in locker installed 10/2001.